One of a collection of twenty bangles made from elephant pad. 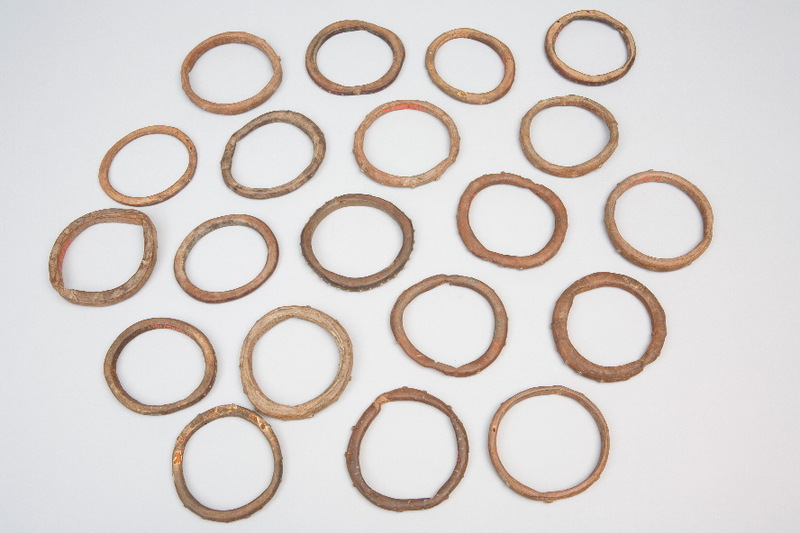 Of this collection, two are plain and the remaining eighteen are studded with small white metal nails, decorating the outer periphery of the bangles. Alldridge describes obtaining these bangles on p.172-73 of his book, The Sherbro and its Hinterland (London: Macmillan, 1901): The town of Garahun was a clearing in the forest in which during the rainy season elephants are met. Hearing than an elephant had only lately been shot, I had the hunter of the town brought before me with his gun, which I found to be a trade weapon costing about 18s. - and known as a Long Red Dane - with a flint lock. With this weapon he was enabled to shoot and kill elephants. I purchased the tail of the beast he had shot, also some of the pads from its feet, from which the people make the elephant bangles which are worn by the Krubas or head warriors. The pad is buried in the ground until it is soft, when the bangles are cut from it and worn as depicted in Figure 56 [BMAG:WA900247]. As many as two dozen may be seen on one arm. Some of these bangles have a setting of small studs of a white metal that is quite soft. They are rarely seen near the coast, as they belong entirely to the up-country, where elephants are found. These elephant-pad bangles are worn only by the men.